We like to think that human beings are naturally kind and morally aware of another’s welfare. In Berlin Syndrome we are confronted with the reality that psychopathy exists and that there are severe predators lurking out in the open. The story follows Clare, a tourist-like woman visiting Berlin, and her meeting of Andi, a teacher who has a sick sort of mind. Clare and Andi meet in a spontaneous drinking affair on top of a building. They get along fairly well and then Andi “runs” into her again on the street. Some time is spent between them and a short time later they fall sexually for one another. That is when the story kicks in because of the relatively quick realization that Clare is trapped in Andi’s apartment. This type of film is so engaging for a variety of reasons. One is that it creates a situation that is so terrifying yet so realistic that we are reminded of what can occur in this world. As an audience member, I could tell in the different minuscule actions of the psychopathic character displayed that he was a bit off. The truly frightening components of Andi’s life structure were that he had a normal job as a teacher and an engaged father who loved him. One can feel the danger created in this film when they see this disturbed criminal interacting with children. The writing of Andi’s lines when he interacts with his fellow teachers, for example, was spot on in terms of his bizarreness. 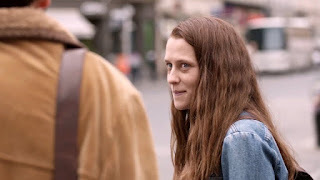 Teresa Palmer, who plays Clare, brings the calm, independent, and yet naive character to life. Her acting as she realizes that he is locking her in the apartment is chilling with its powerfulness. We see in that scene alone, the nightmare of being victim to a crime that can happen to any undiscerning individual.